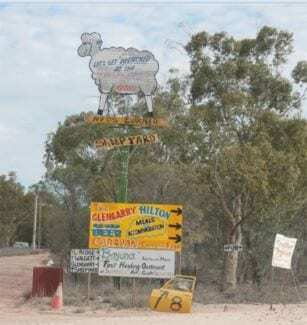 Located approximately 70 kilometers west of Lightning Ridge, Grawin, Glengarry and Sheepyards offer an unrivaled opportunity to see how life is lived on a frontier-style opal field. 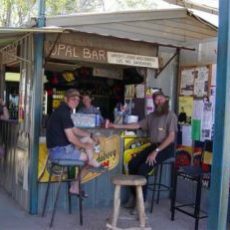 Ever since the first discovery of opal in the area in 1905, people seeking their fortune have come and gone in waves with each new strike, which makes for a community of colourful characters. Grawin, Glengarry and the Sheepyards can be accessed via the small village of Cumborah. The road is sealed up to the Grawin turnoff and the gravel mining roads are in reasonable condition. When driven at the right speed they are suitable for caravans and other vehicles. It is worth remembering though, that this is a restricted area so best to stick to the main areas. 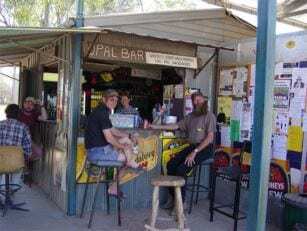 The Club in the Scrub is a hub of social activity in Grawin. 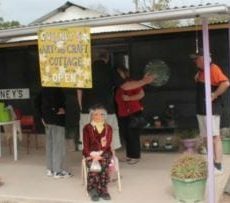 The club offers a range of activities, sporting events, raffles, good foods, regular entertainment and community events. Open 7days from 10am until late during peak season. As of the 1st of December 2018 through to the 28th of February 2019 the Grawin Club will not be opening until 11am. The café is now closed for coffee until the New Year however lunch and dinner will still be available until further notice. Nestled in the heart of the infamous Glengarry Opal field. Nothing like the Sydney Hilton but with lots more atmosphere this unique pub offers Backpacker style air-conditioned accommodation, meals and snacks everyday, swap & go gas, laundry facilities and Flash Flush Toilets!!! Visit the Sheepyard Inn for a cold beer, cooled meal, groceries, gas and local tourist information. Opal cutting demonstrations and pool comp Wednesday night. Free camp area with shower and toilets. Tours groups welcome. Amongst the shanties, old caravans and piles of mullock you will find the beautiful Sheepyard and Community War Memorial built by miners – many of which were Vietnam Veterans. On ANZAC Day, hundreds of war veterans. 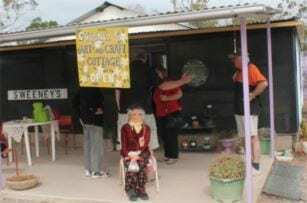 locals and visitors flock to the sheepyard for the moving Anzac Day service. Purchase locally made arts, crafts, gifts and souvenirs, Sweeney’s sells everything from Crocheted rugs to opal jewellery. Open 7days from 10am until late. As of the 1st of December 2018 through to the 28th of February 2019 the Grawin Club will not be opening until 11am.